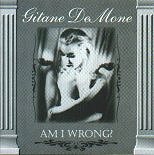 In Music We Trust - Gitane DeMone: Am I Wrong? Paying her dues throughout the musical industry, Gitane DeMone is best known for her vocals/keyboard work in Los Angeles' goth-rock band Christian Death. Starting out with the early eighties new wave band Pompeii 99, in 1983 the group soon merged with Rozz Williams to form the second incarnation of Christian Death. She stayed with the group until 1989, when she left to pursue her own solo material. After collaborating with other artists, and working on her own solo material, her latest release is soft, delicate, hard, and dark all rolled into one. Relying on her voice and the acoustic guitar, there isn't much room for error. But with a beautiful voice and soft drips of guitar accompanying her voice, she pulls it off nicely. The music is very dream-oriented, sleepy and calm, giving you something calm and mellow you can pop in when you just want to lay there and let something surround you and help ease your body. But she also has not forgotten her past, jumping into goth-rock numbers like "My Classic Ego." All goth-rock, she suddenly slips you out of that deep sleep and crosses your lovely thoughts with nightmares. Although she doesn't do the goth-rock thing that bad, it sounds really out of place on her album, and just seems to grab at straws. Maybe on a gothic album she could fit in a few soft numbers, but slipping something like this on a predominately light platform just doesn't work. Keeping it up on "Speed," she seems to want to just rock out and pass on some of her aggression, something she can't do with the quieter stuff. But once again, it just doesn't work. When she is on her acoustic guitar (light percussion is ok), she can pull off a number that is soft enough to relax you, and dreamy enough to keep you cozy. However, when she mixes this style with her other musical identities, she starts to lose everything she was trying to shape. I'll give this album a C.